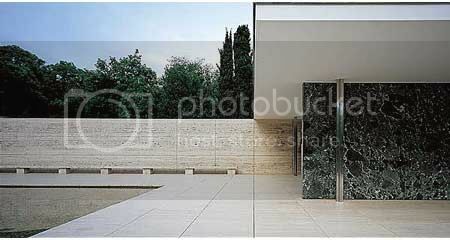 The Barcelona Pavilion was designed to represent Germany’s "openness, liberality, modernity and internationalism…we do not want anything but clarity, simplicity and honesty..."
When to visit: From monday to sunday: 10:00 to 20:00 h. The Pavilion may occasionally be closed to the public or access may be restricted. Do check their website first. 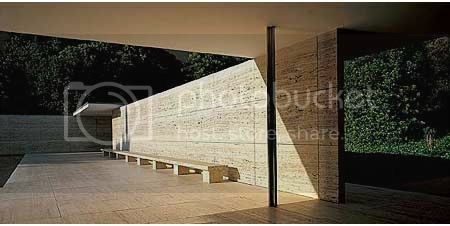 The Barcelona Pavilion, a work emblematic of the Modern Movement, has been exhaustively studied and interpreted as well as having inspired the oeuvre of several generations of architects. 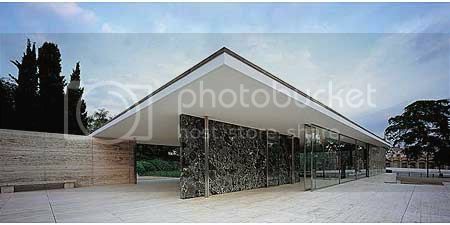 It was designed by Ludwig Mies van der Rohe (1886-1969) as the German national pavilion for the 1929 Barcelona International Exhibition, held on Montjuïc. 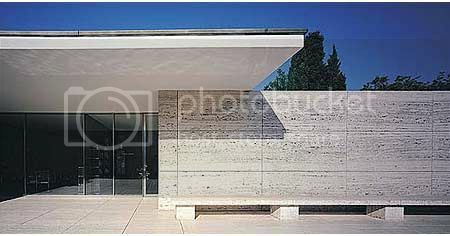 Built from glass, travertine and different kinds of marble, the Pavilion was conceived to accommodate the official reception presided over by King Alphonso XIII of Spain along with the German authorities. After the closure of the Exhibition, the Pavilion was disassembled in 1930 when the Germany's Goverment failed to find a buyer. As time went by, it became a key point of reference not only in Mies van der Rohe's own career but also in twentieth-century architecture as a whole. Given the significance and reputation of the Pavilion, thoughts turned towards its possible reconstruction. The pavillion itself has no real function. The plan is asymmetric and fluid with a continuous flow of space. 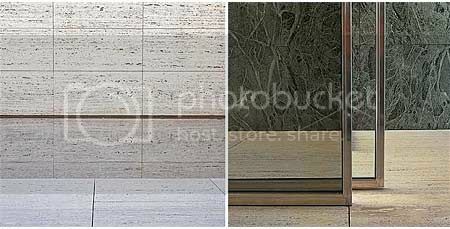 Wall partitions are made of both transparent and opaque glass as well as highly polished marble. 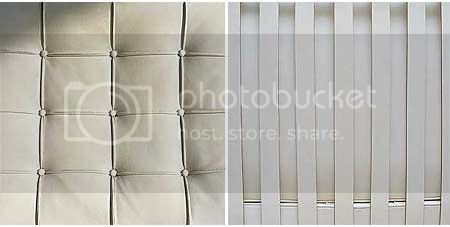 The low flat roof is supported by delicate metal supports. As has often been noted, the building has a kind of classical serenity. Despite its apparently simple rectangular plan, there are almost no corners in the building, or anything that might suggest you are in a box. The generous canopy roof, walls that stop well short of abutting one another, and the floor-to-ceiling glazing break down the distinction between inside and outside. 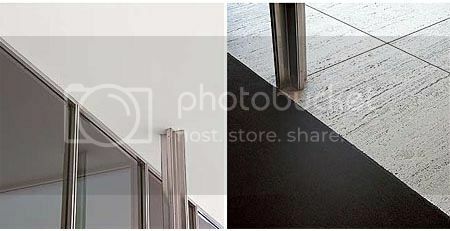 Even the doors are in the form of two halves of an all-glass wall, which rotate about a pivot in the floor and ceiling a few inches from the edge: the result is that when opened through ninety degrees each door becomes just another freestanding, parallel glass plane in keeping with the other planes defining the spaces in the building. 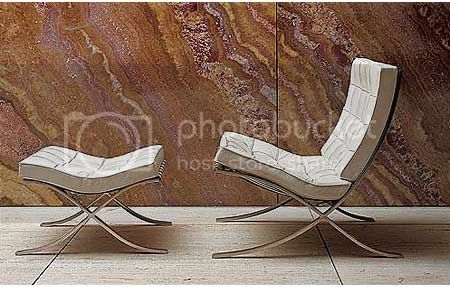 Mies van der Rohe's originality in the use of materials lay not so much in novelty as in the ideal of modernity they expressed through the rigour of their geometry, the precision of the pieces and the clarity of their assembly. 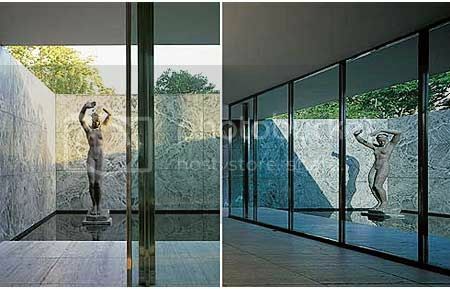 The sculpture is a bronze reproduction of the piece entitled Alba (Dawn) by Georg Kolbe, a contemporary of Mies van der Rohe's. Masterfully placed at one end of the small pond, the sculpture is reflected not only in the water but also in the marble and glass, thereby creating the sensation that it is multiplied in space, while its curves contrast with the geometrical purity of the building. 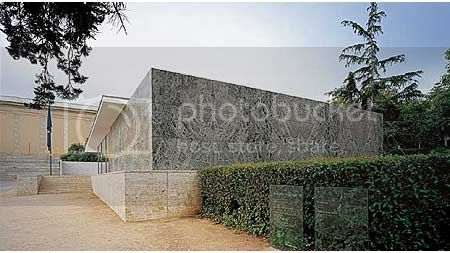 Thank for this post about barselona pavilion! It is always interesting... I lose my pictures from my last visit to this place, and your foto is to point for me.